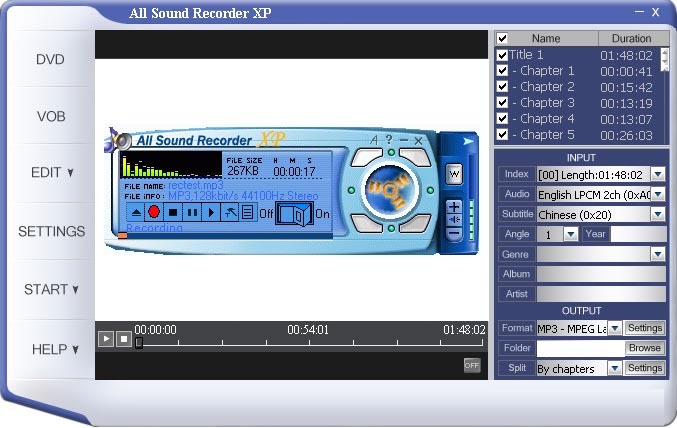 All Sound Recorder XP is a All-in-one Audio Recorder and Sound editor software. You can record real-time sound from any source like microphone, line-in device (such as Tape/LP) and any other sound playing program (Winamp/Realone player/Windows media player/Quicktime) to mp3/wav/wma/ogg formats on the fly. Record from all sound sources (Microphone, Cassette Tape, RealAudio, Game, cds, dvds). Most functions can be called up with a simple mouse click or menu selection. You can conveniently make skins for DVD Ripper through our color scheme system. Qweas is providing links to CNC All Sound Recorder 2008.3.1.0423 as a courtesy, and makes no representations regarding CNC All Sound Recorder or any other applications or any information related thereto. Any questions, complaints or claims regarding this application CNC All Sound Recorder 2008.3.1.0423 must be directed to the appropriate software vendor. You may click the publisher link of CNC All Sound Recorder on the top of this page to get more details about the vendor.